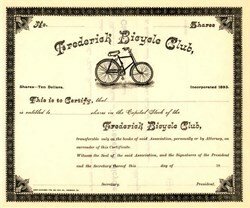 Beautifully engraved unissued certificate from the Frederick Bicycle Club printed in 1893. This historic document was printed by the Great Southern Printing Company of Frederick, Maryland and has an ornate border around it with a vignette of an early bicycle (Columbia Century made by Pope Manufacturing Company). Vignettes of old bicycles on stock certificates are extremely RARE.